This weeked I had a 2 Day Private Coaching with Bill Bruce. He had originally contacted me asking if I was going to be holding another Beginner's Painting Class in his area. He had heard about the first one and was keen to attend. When he found out that the next one wouldn't be till 2018 he asked about a private lesson. He explained that he was brand new to miniature painting but had an art background. He wanted to learn the fundamentals to get started. So I booked him in as my last 2 Day Private Coaching for 2017. Below are examples of Bill's work that he sent to me in our email exchange. Since he was practicing painting on board game models, I decided we would work on the Dark Sword Shaman model. She is a small model with a few nice details and would be about the size of a lot of models at home. I usually start off Private Coachings by introducing Color Theory, as you can't really progress in your painting without understanding the basics. Since Bill had a background in art, we were able to largely skip over this and instead move right into technique. As we have summer approaching in Australia, I taught him glazing since a wet palette is necessary for painting once it warms up here. I explained the reasons why glazing is an important technique and some of the finer points of applying it. Then let Bill to work on his own for a bit, applying basecoat colors to his model. Instead of using game range paints, he threw himself in the deep end and used my limited palette of Artist Acrylics for the weekend. That meant he had to think about color theory and how to mix various colors. Due to his art background, I was able to explain how to mix to get certain results and he quickly understood. Bill's first time glazing! He did a really good job for a first try at this technique which can be a bit fiddly. After lunch, we revisited glazing and I helped him troubleshoot the technique. We also discussed how to apply shadows and highlights. Again, I left him to his own devices for a bit to give shading a try. He wasn't sure if he had shaded dark enough so I taught him the Camera Trick for checking contrast. He realized after trying it that he needed to make his shadows even darker. I explained why that was the case and let him take another crack at it. Then we moved onto highlighting for a little bit before breaking for the night. Where we got the first night! The second day, Bill started back on highlights to see if he could bring his contrast up. Then we moved onto a bit of discussion about the artists I recommend following as well as any blogs and videos I think would be helpful. I also recommended he get on Pinterest and Instagram. Pinterest is great for finding reference art and inspiration for pieces. Instagram is great because you can follow the work of many artists without needing to be on their Facebook feed. It is an excellent tool. 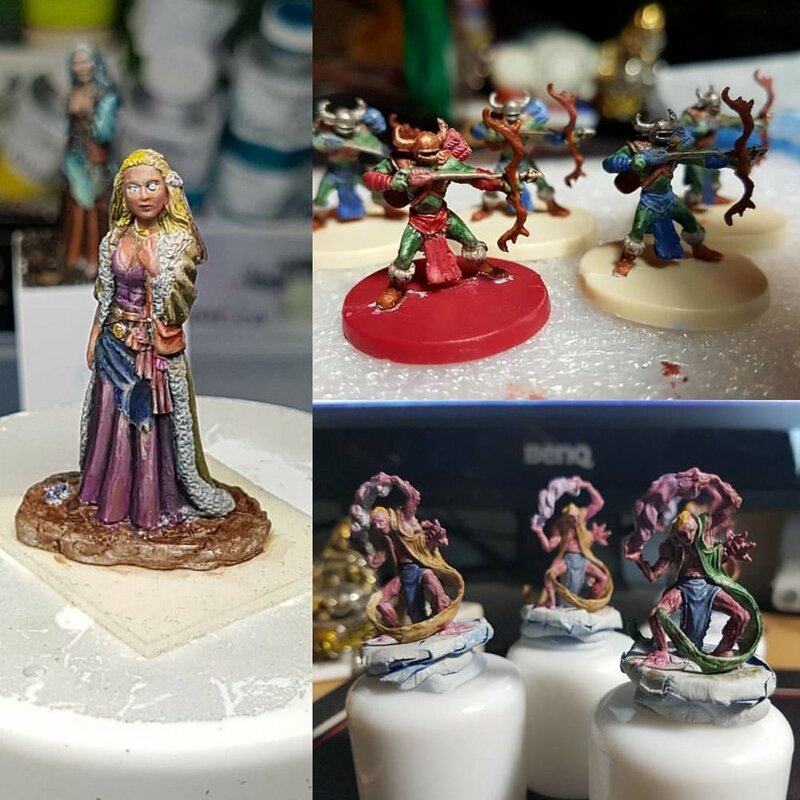 We also discussed the differences between using True Metallics and Non-Metallics, how to use inks with your painting, the varied uses of an airbrush, and the properties of different sculpting putties. He also realized the importance of a larger palette as he ran out of room on his. I let him use my extra palette and explained how to build one on his own. Bill's background is in digital art so he asked a question that tickled me a bit, "I am used to being able to experiment and then just delete a layer or click my Undo Button. How do you handle when you make mistakes?" I told him that you will always make mistakes and you will learn from them. You never stop making mistakes. 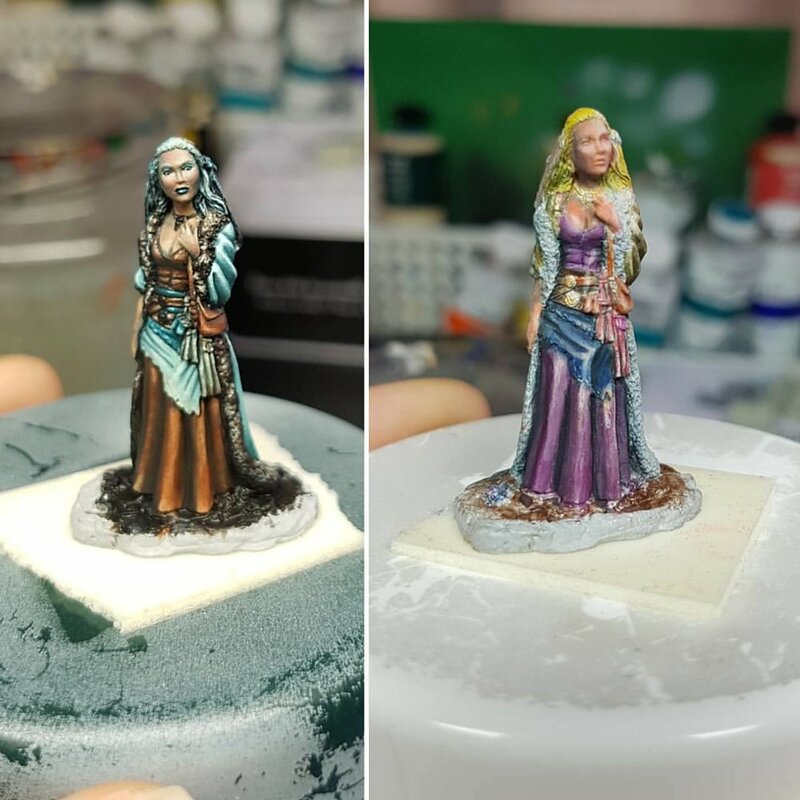 It is an important part of your process to learn how to mix paints, how to apply your colors to your model and what works for you. He said he is afraid of making mistakes. I told him not to be because you can never ruin a model unless you melt it or break it into pieces. Otherwise, you can always paint over your mistakes or strip the paint off. At the close of the second day, he had a model that was a huge leap forward compared to the "Before" pictures he sent me when he booked the Private Coaching. I am very proud of his progress he made over the weekend and the effort he put into it. I can't wait to see what he does with a couple months of practice under his belt.